This game is a great addition to your practice routine before an upcoming event or tournament round. It will allow a player to finely tune their feel for face to path and face to target control. A player will pick their preferred shot shape or curve at the very beginning of the game and as they progress, they will learn how to repeat and control the severity of the selected curve. This differs from the traditional 9 shot drill where a player will be playing with the face to path relationship in order to hit different curvatures at various flights. The added challenge of this drill is that if at any point, a player hits a "double-cross", or a shot that is the opposite of the curve that was selected, they will have to start the game over from scratch. Ultimately, this game will help you build a "go-to" shot that you can repeat on the course and under pressure, while also refining and raising the awareness for your release mechanics. 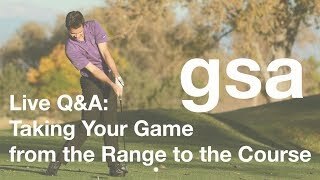 Live Q&A: Taking Your Game from the Range to the Course - Feb 1, 2018 A live Q&A to answer your golf questions. 9 Shot Drill The famous drill used to refine your face and face-to-path. Play A Course On The Range One of my favorite games for adding a little pressure to your range practice.